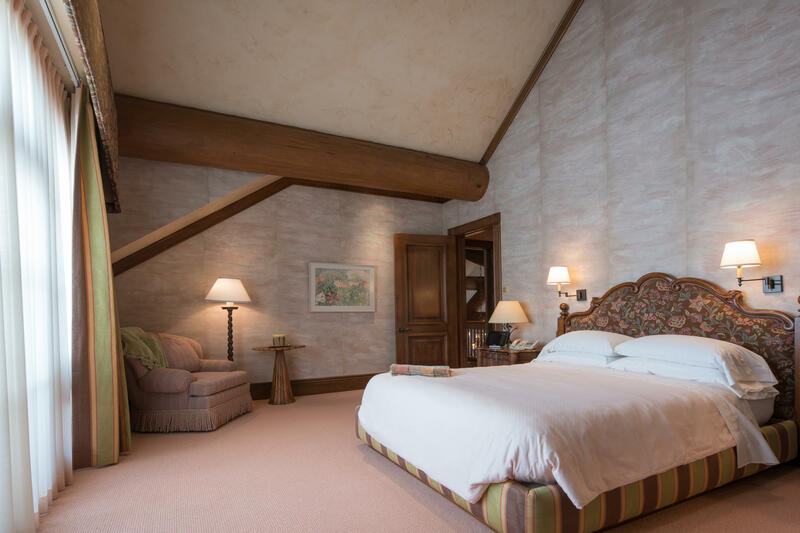 The property consists of a grand lodge-style main house, a spectacular outdoor entertaining area and quarters for the household manager. 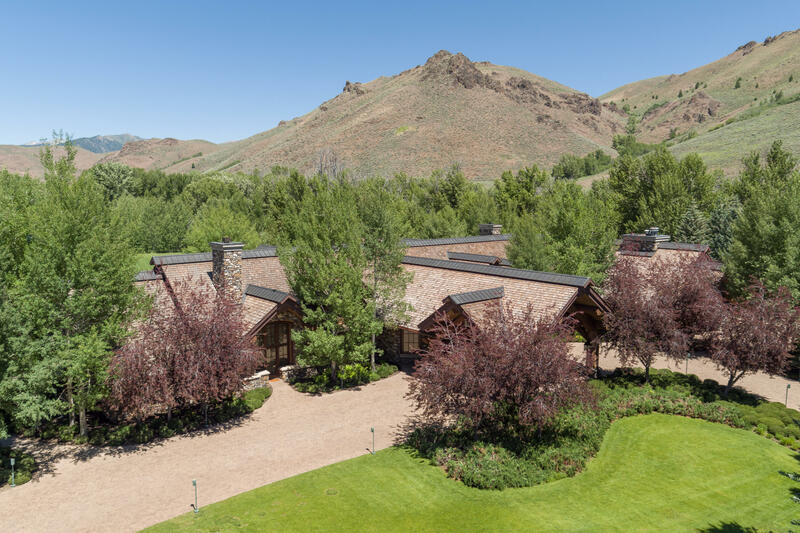 Massive windows under deep eaves frame views of the surrounding Boulder Mountains, Griffin Butte and the Bigwood River as works of art, while a series of wings off of the main axis are defined by the home's expansive cedar shake roofline, creating a sun-drenched enclave that is seamlessly integrated with its surrounding grounds, yet carefully screened on all sides by stands of evergreen forest. 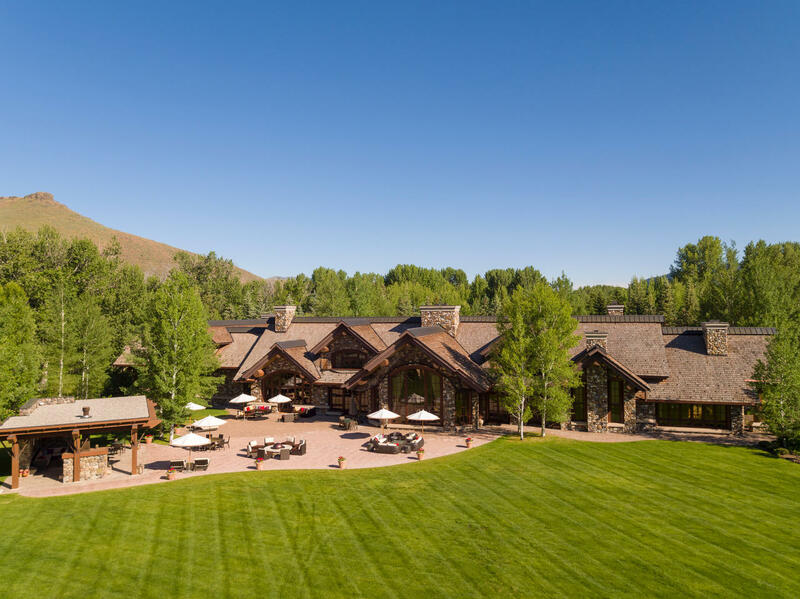 The main house is voluminous in scale, offering 15,000 square feet of opulently appointed living space, yet its sumptuous selection of building materials and surfaces ensures that every room maintains a sense of intimacy and approachable luxury. 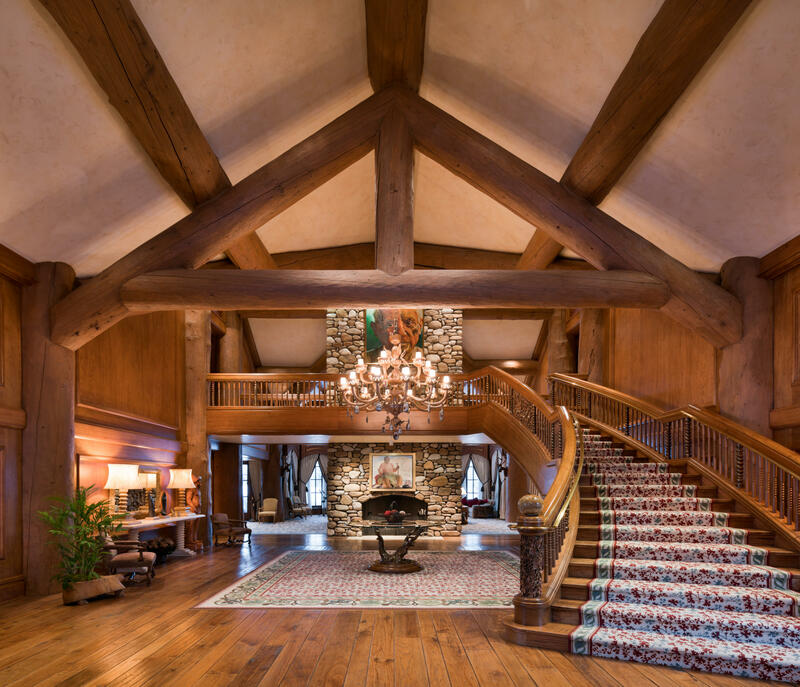 Four bedrooms and six baths are discreetly spread over two stories, with old-growth logs used to great effect as structural elements that also convey warmth and history. 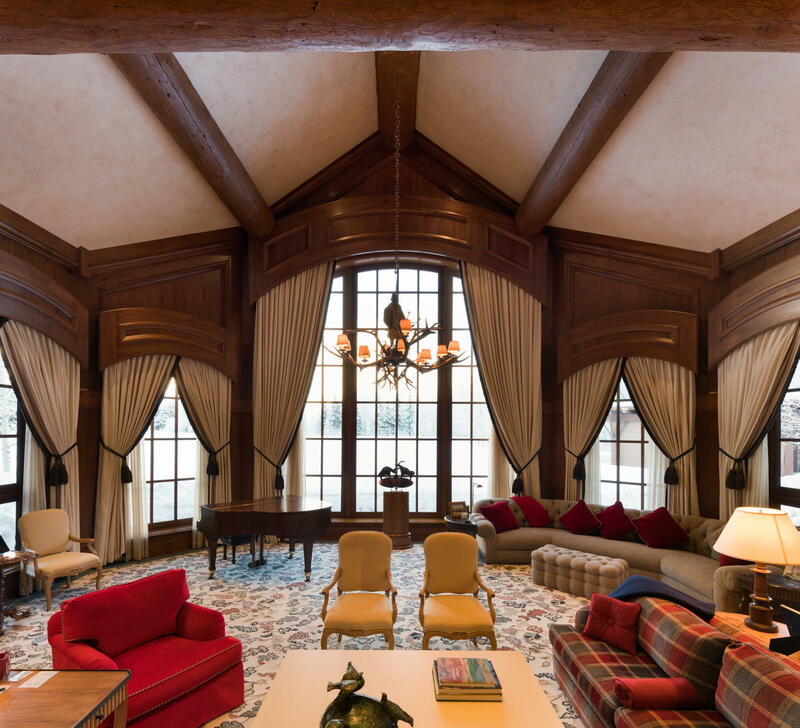 Meticulously hand-carved woodwork provides a counterpoint of European refinement and luxury and virtually all of the public great spaces feature two-story vaulted ceilings and classically detailed paneling, augmented by decorative plaster that changes tone with the light throughout the day. 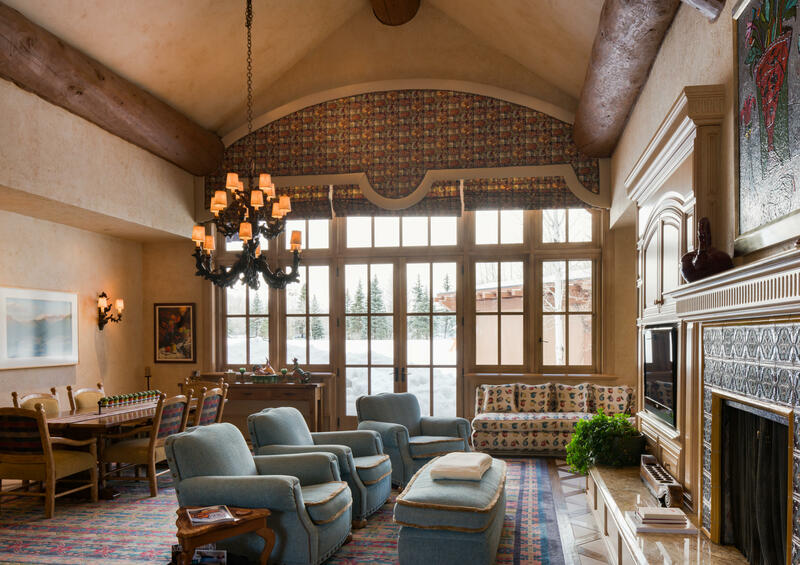 No fewer than six fireplaces provide both literal and figurative warmth throughout the interior, with a central river rock mantel and chimney serving as the first floor focal point. 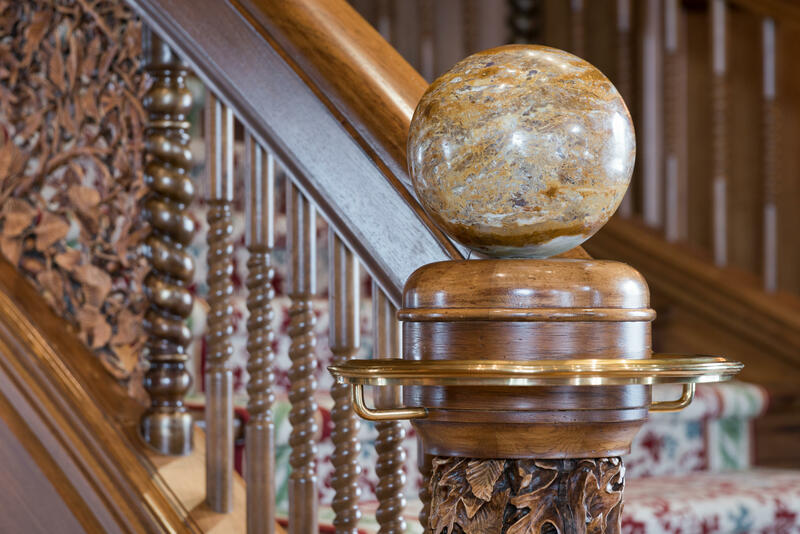 There is an artisan's hand evident in every detail of this singular residence, from its raw materials to its finishing touches. 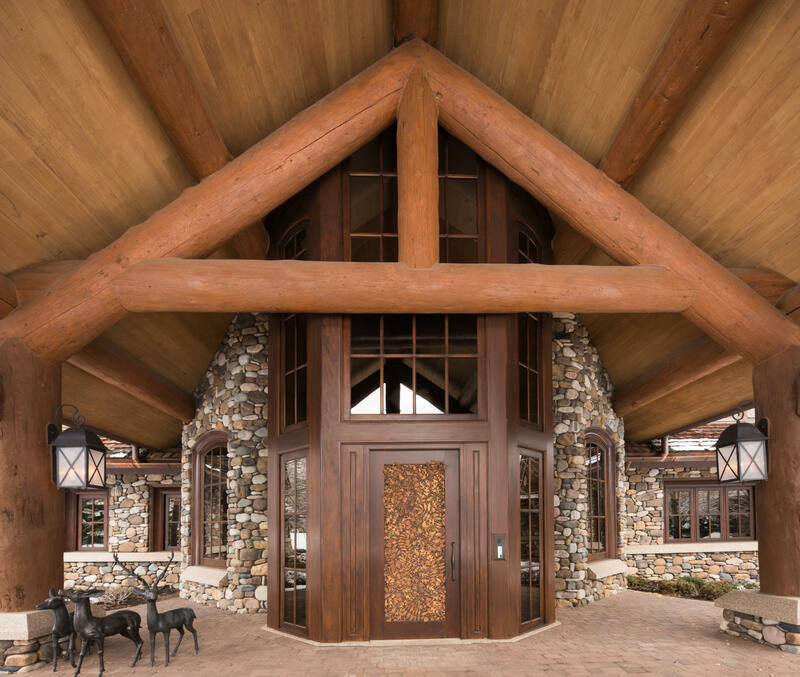 Every log used in its construction was hand selected from the Bitterroot Mountains, resulting in a timber frame structure that is testament to the builder's art, and of a scale seldom seen in contemporary or even historic buildings. 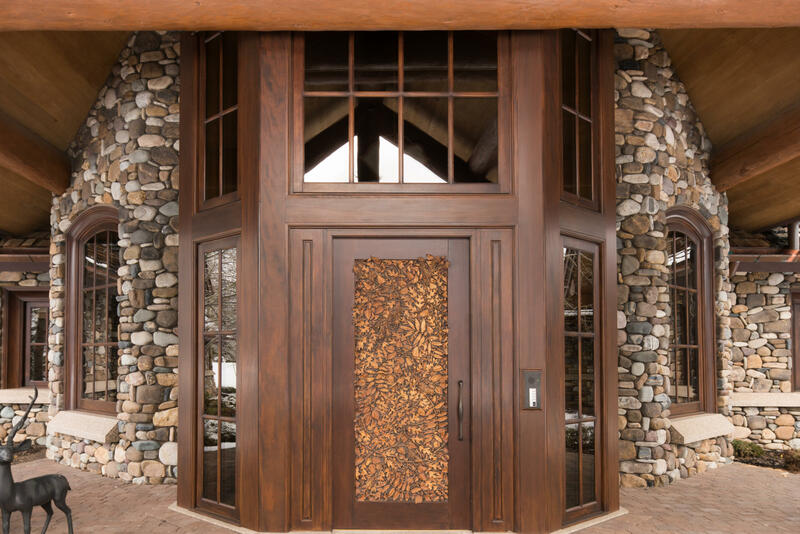 Stonemasons meticulously selected and mixed the locally sourced river rock that clads the house to achieve a perfect blend of color, scale and texture, and the front entryway is simply a masterpiece of deep relief woodcarving that must be seen to be appreciated. 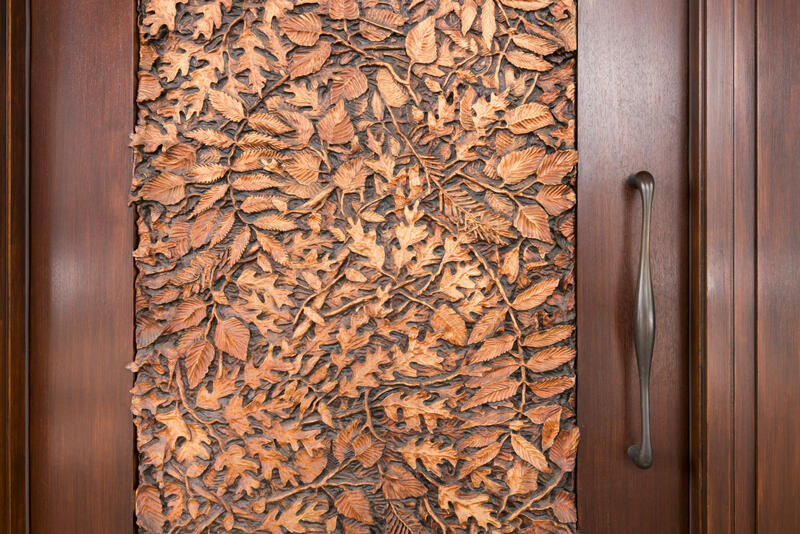 Inside, some of the most accomplished woodcarvers in the world were employed to handcraft thousands of linear feet of custom moldings, paneling and architectural elements, many of which feature the same intricate leaf pattern used on the entry. 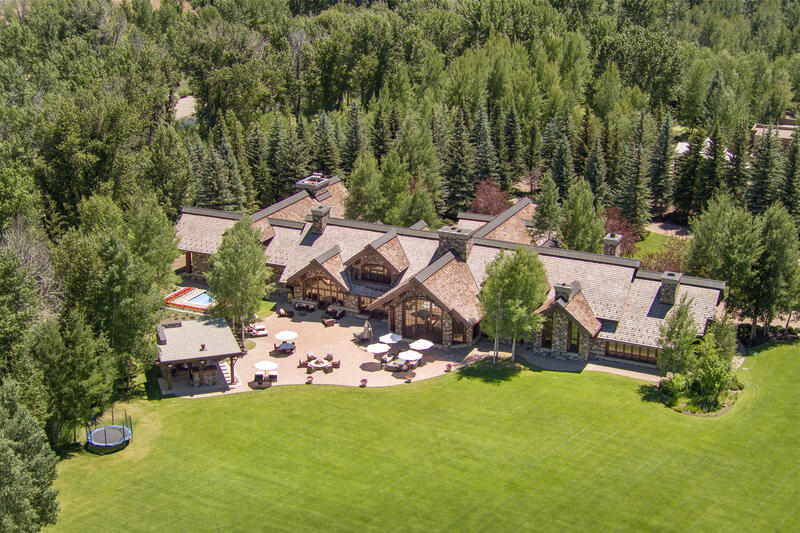 Public areas are designed to offer vast amounts of space for entertaining and casual relaxation alike, with cathedral vaulted ceilings, hand-troweled plaster finishes and floor-to-ceiling windows that flood the house with natural light and capture stunning views of the Boulder Mountains and surrounding nature. 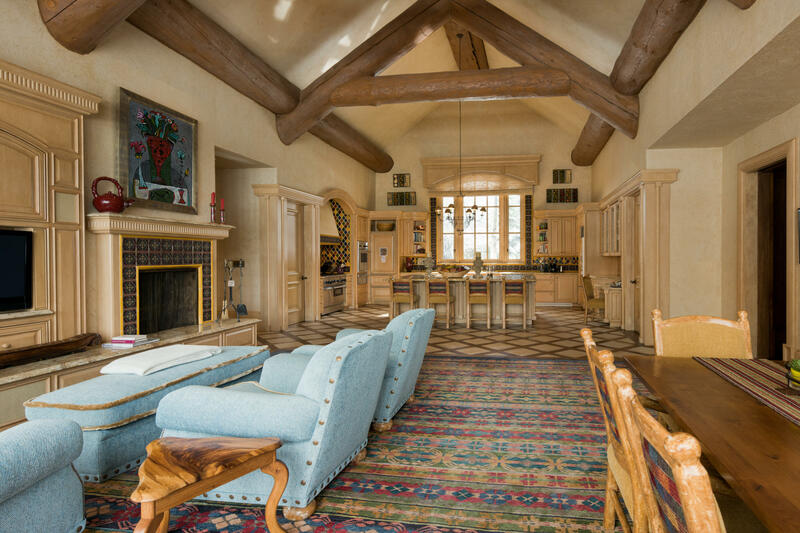 The centerpiece of the house is a grand living room with a formal dining room and bar area on either side. 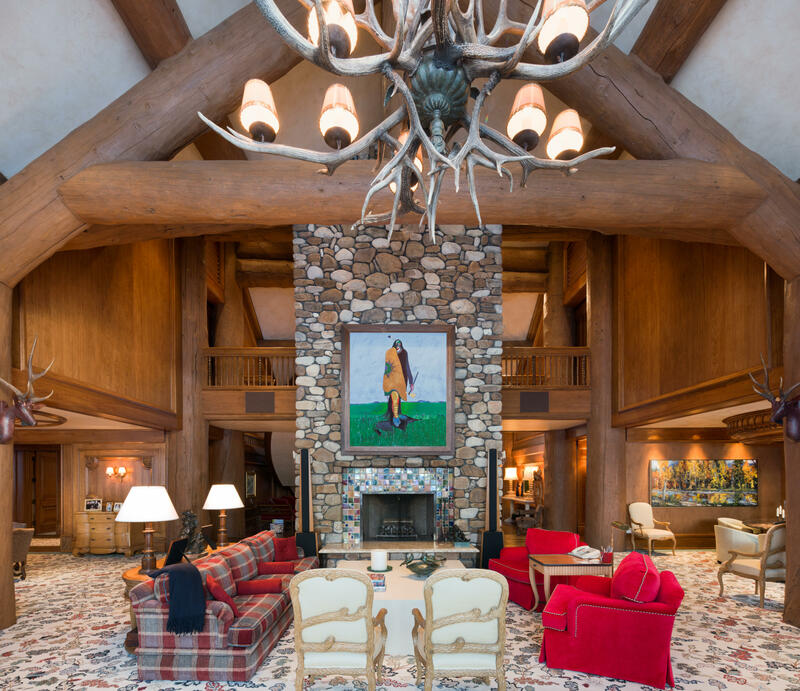 This is a dramatic space, defined by a finely crafted log structure that supports a two-story vaulted ceiling with the property's signature stone fireplace rising through its center. 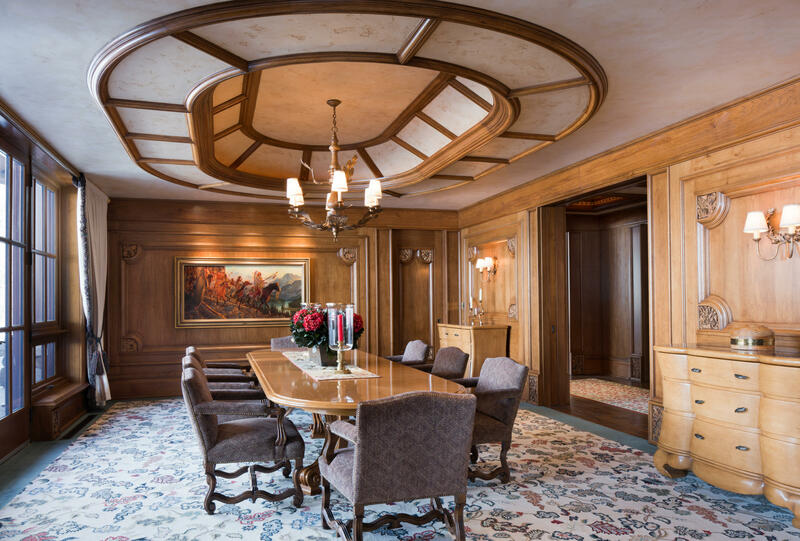 The dining room is ornately paneled, with an oval coffered ceiling and direct access to the grounds through French doors, while the bar functions as a relaxed lounge area for conversation or after dinner cocktails. 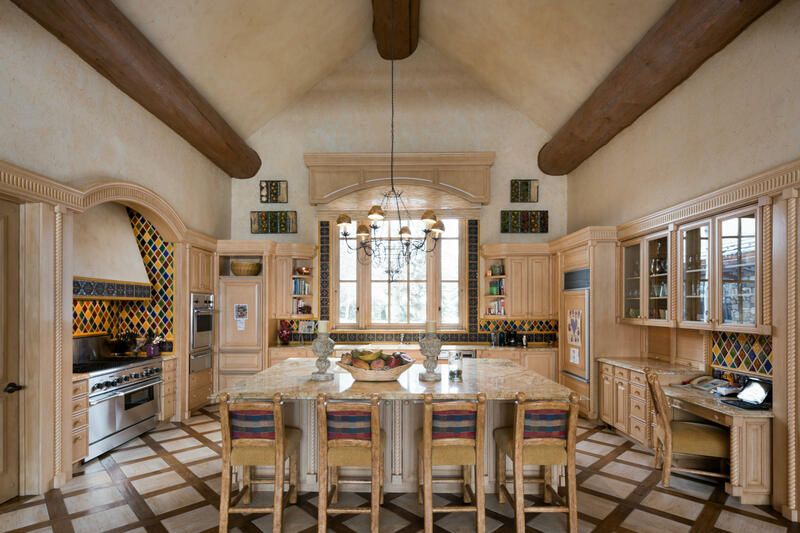 The kitchen is both a convivial hub of the home and a spacious venue for casual entertaining. 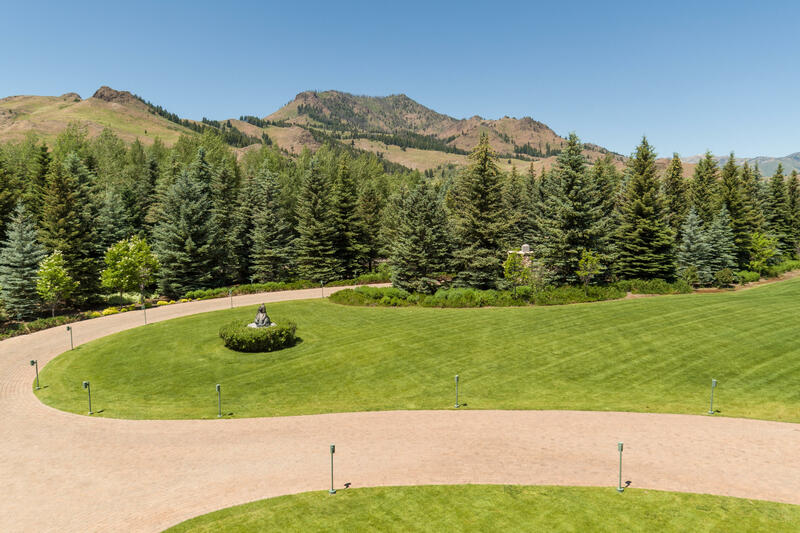 It is elegantly appointed with custom carved maple cabinetry, exotic slab granite counters, artisanal tile backsplashes and a limestone and wood parquet floor. 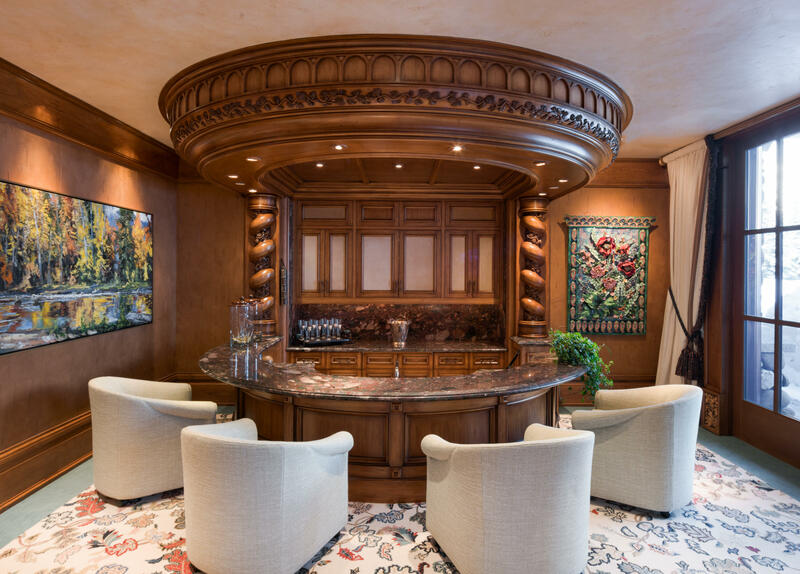 A cooking alcove supports a commercial gas range with matching ventilation, while twin SubZero refrigerators, a built-in wall oven and warming drawer and a Miele dishwasher complete the compliment of appliances. 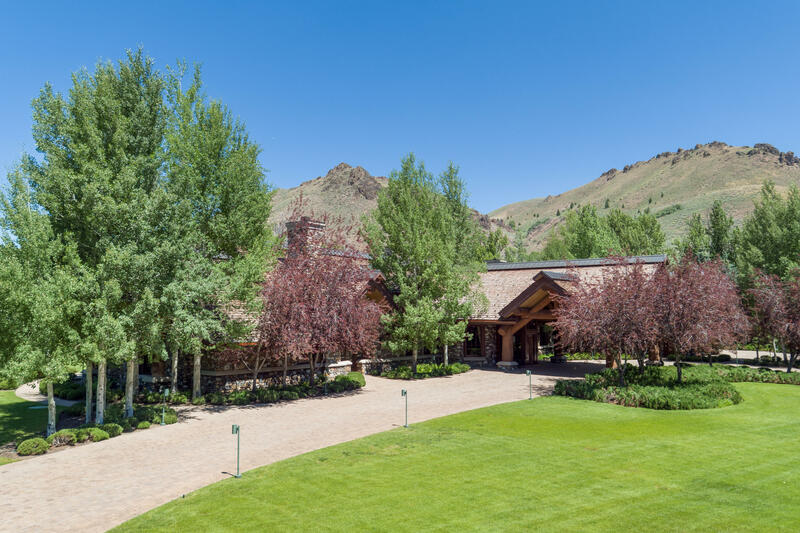 The large central island is a natural gathering place for cooking or casual meals, while an attached great room contains space for a dining area and fireplace hearth with plenty of room for seating. 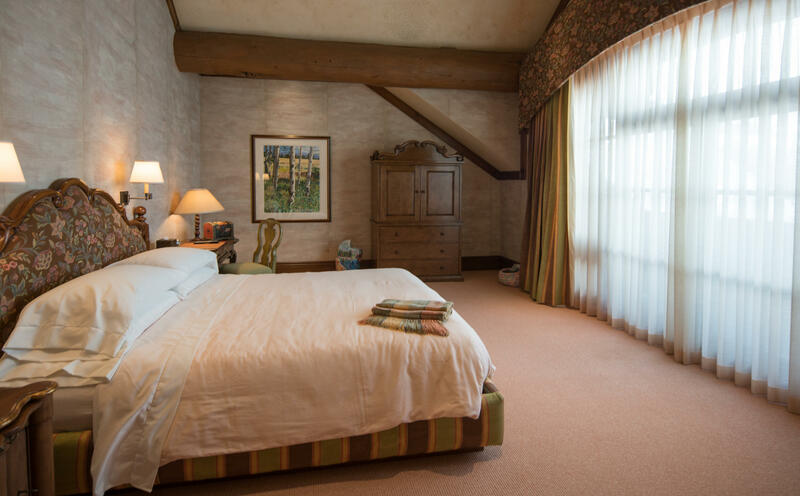 The main level master suite offers mesmerizing views over the pastures from its walls of windows, as well as a terrific sense of volume afforded by its vaulted ceilings and paneled fireplace wall. 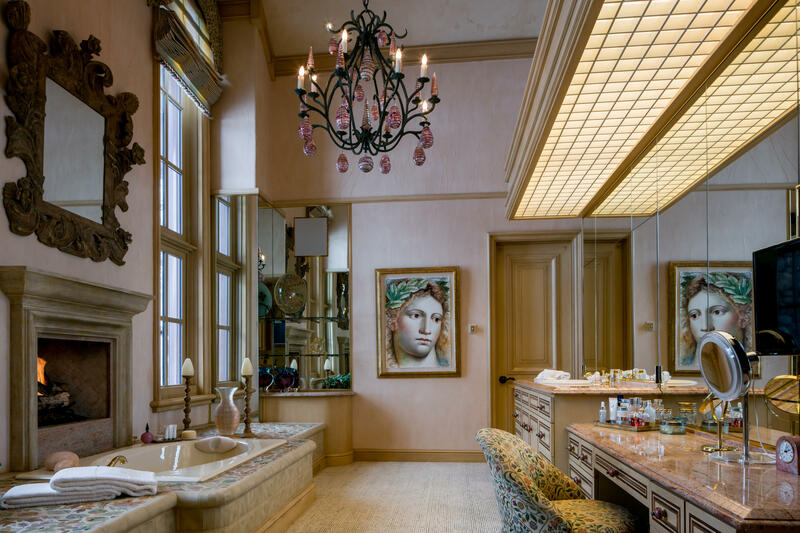 There is ample space for sitting areas and display, and the suite includes separate baths and dressing rooms for each of its occupants. 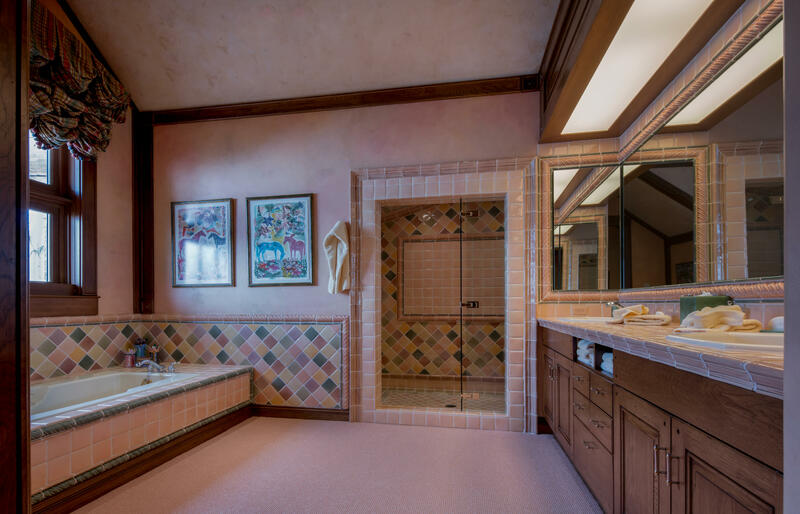 One bath features a deep soaking tub with its own gas fireplace and a wall-length vanity, while the other offers a huge steam shower and a fully illuminated ceiling. 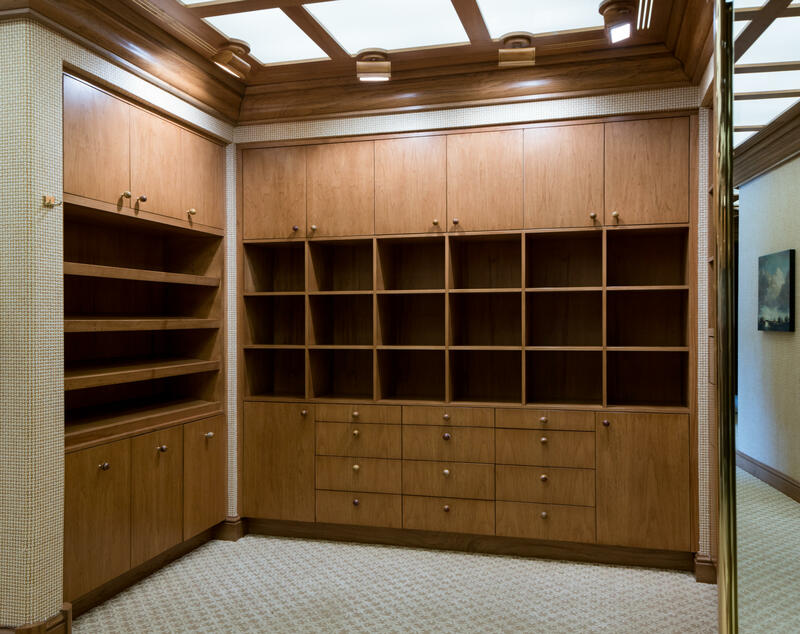 Dressing rooms are appointed with custom storage cabinetry and upholstered walls to match those found throughout the suite. 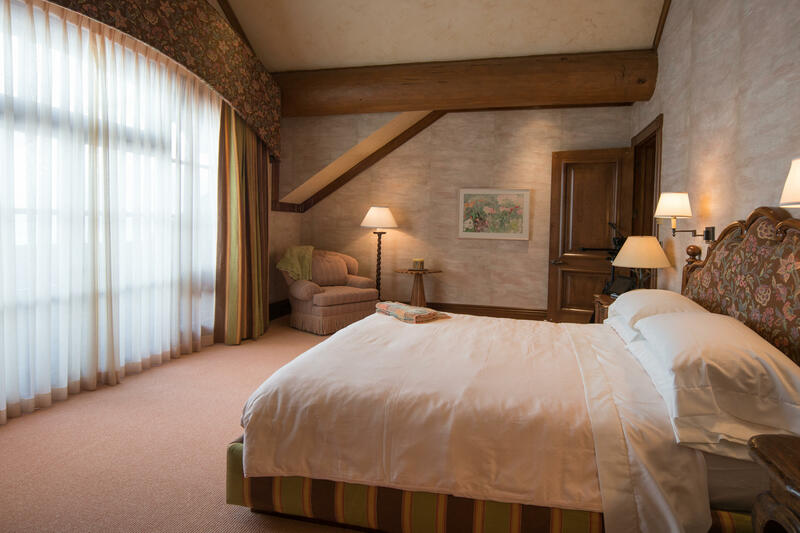 The house affords every comfort and amenity imaginable to its residents and guests. 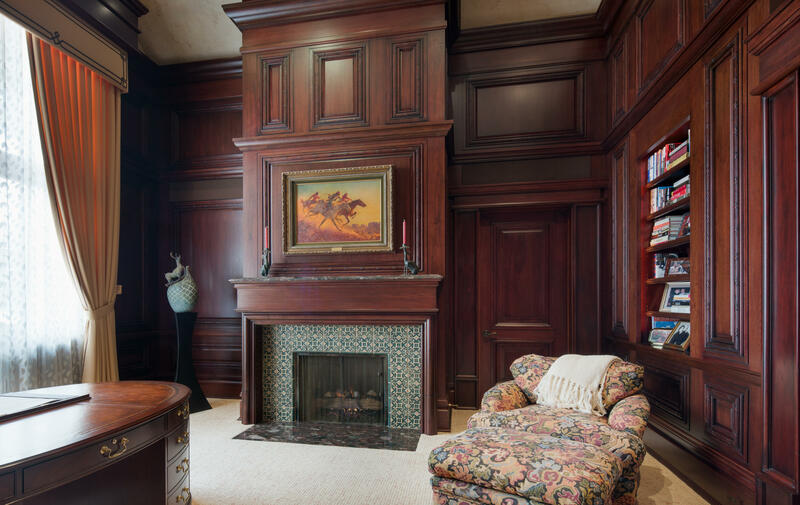 There is a stunning mahogany paneled office on the main floor with its own fireplace and library that is the ideal home base for business and reflection. 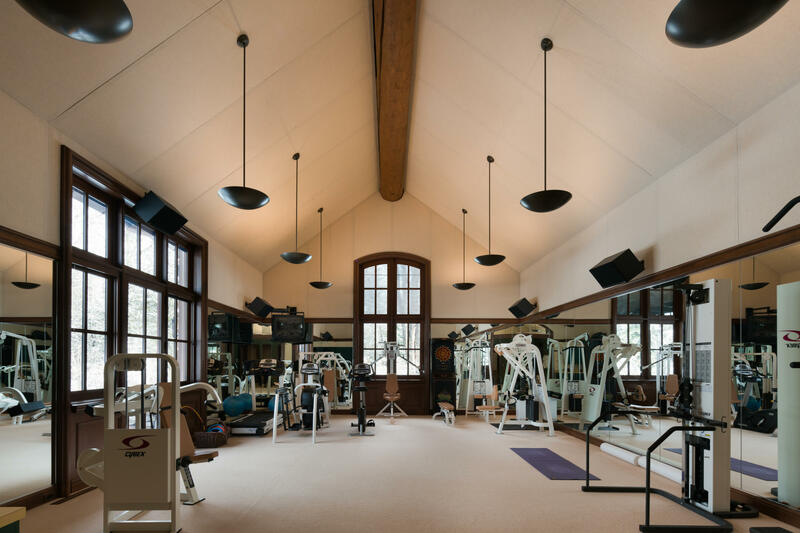 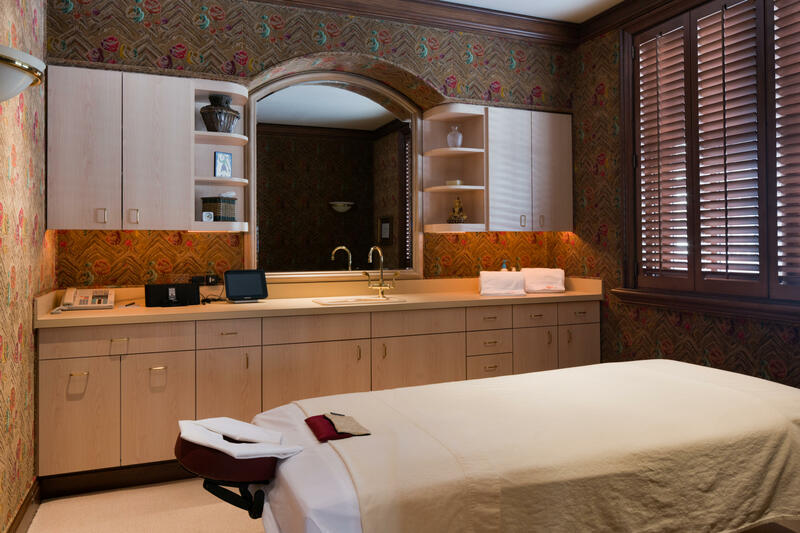 A dedicated fitness wing provides a world-class workout facility that includes a private massage room and dedicated bath. 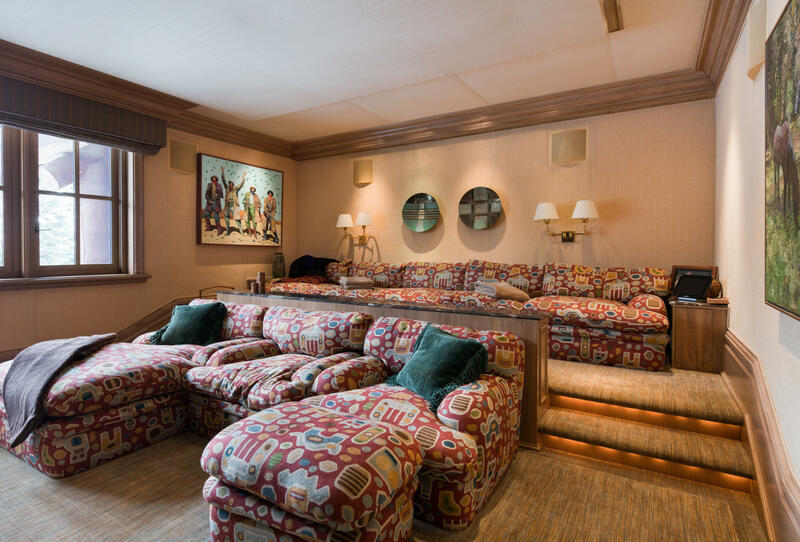 The media room is a wonderful private enclave for relaxing at the movies, with integrated theater-quality audio and video systems, a wet bar and stadium seating, while a large wine room provides plenty of long-term storage for favorite vintages. 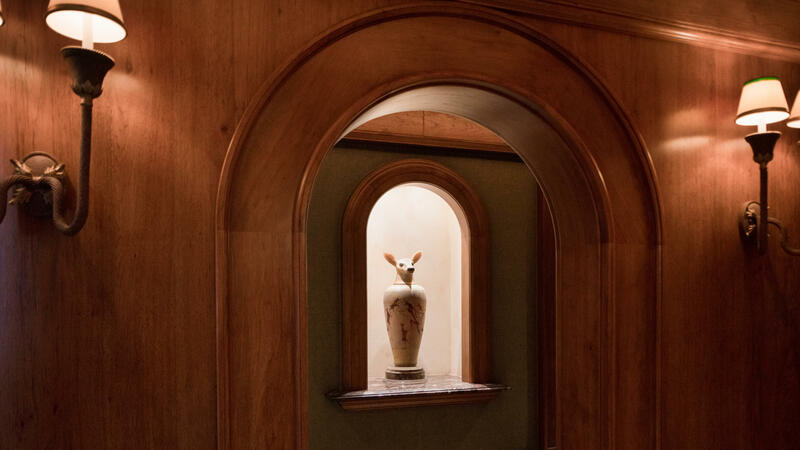 Thoughtful details abound throughout the property to make daily living effortless and endlessly indulgent. 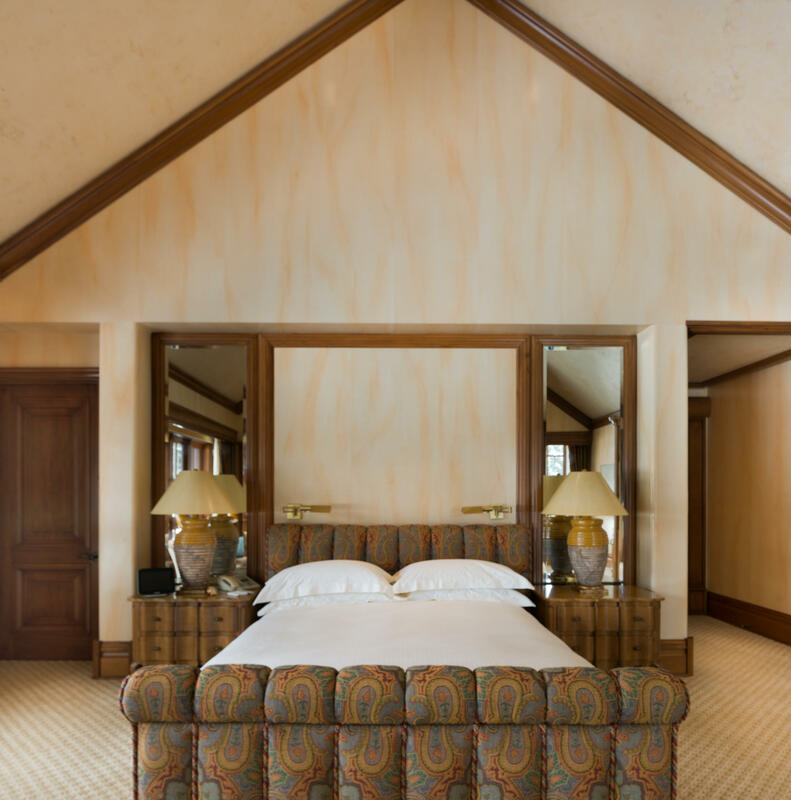 All hallways feature lit coffered ceilings for indirectly illuminated passage at all hours, and many rooms offer beautifully upholstered walls for sound deadening and a warm sense of enclosure. 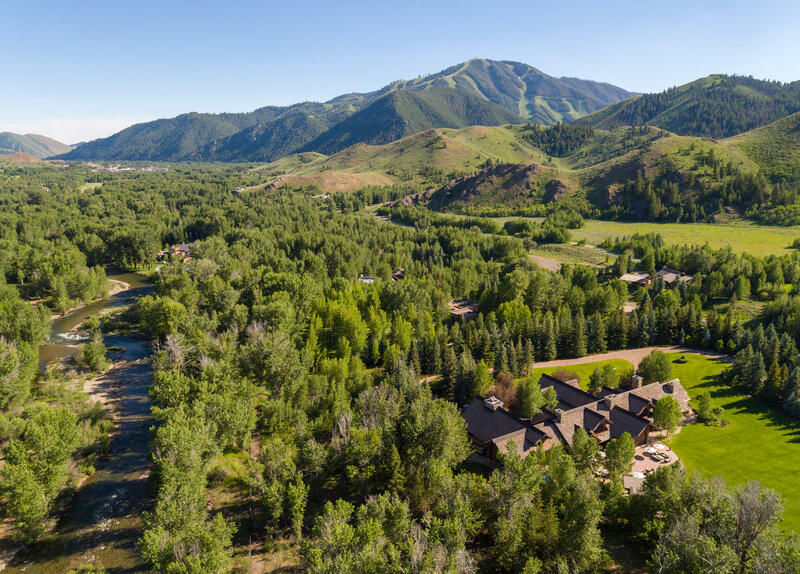 Guests are treated just as graciously as full-time residents in two upstairs suites that each include balconies overlooking the mountains, large sleeping quarters and spa-like baths with soaking tubs, steam showers and walk-in closets. 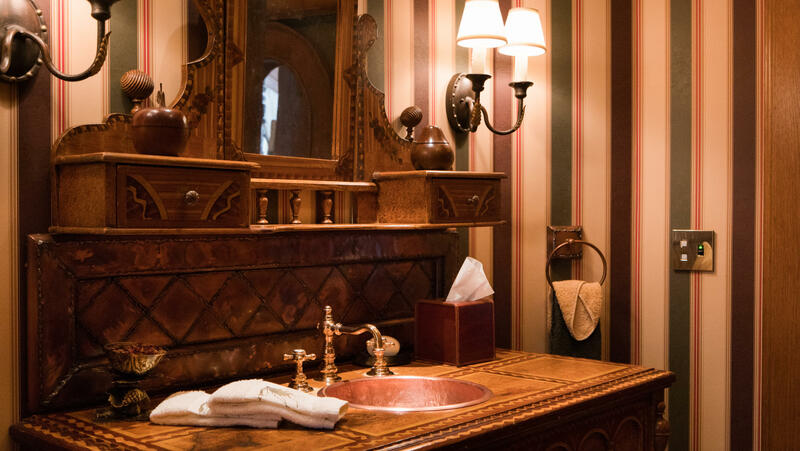 Even the powder room is a work of art, with an octagonal coffered ceiling and ornate antique vanity with copper sink. 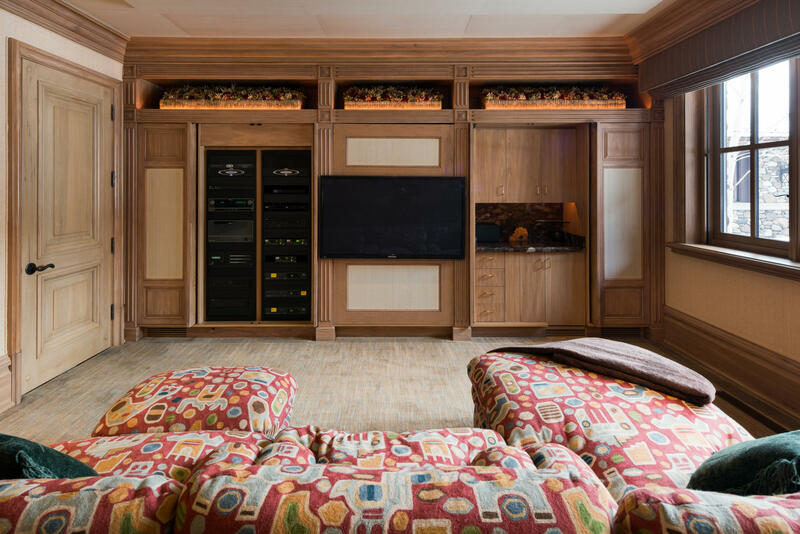 A state-of-the-art Crestron home automation system controls all HVAC, lighting, blinds, music and media, while high-tech networking ensures connectivity throughout the house. 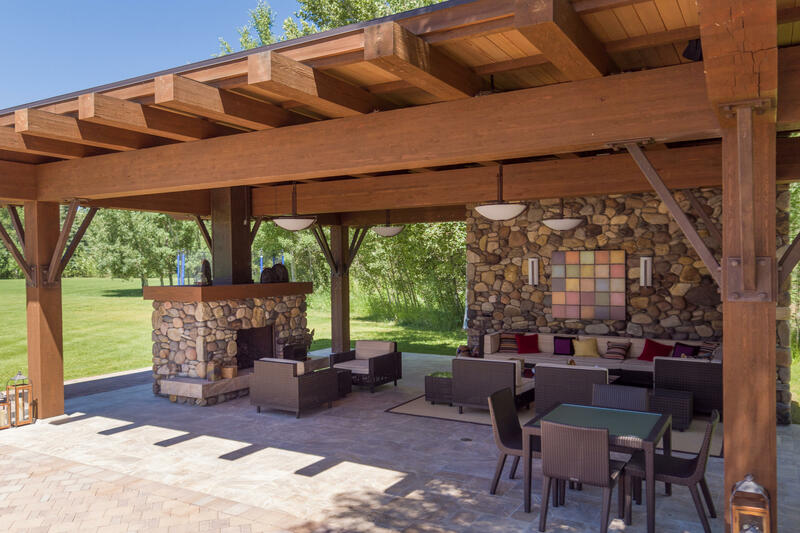 ,A truly breathtaking outdoor living space sits off the back of the residence, with numerous carefully delineated seating areas and a covered and heated pavilion with its own fireplace. 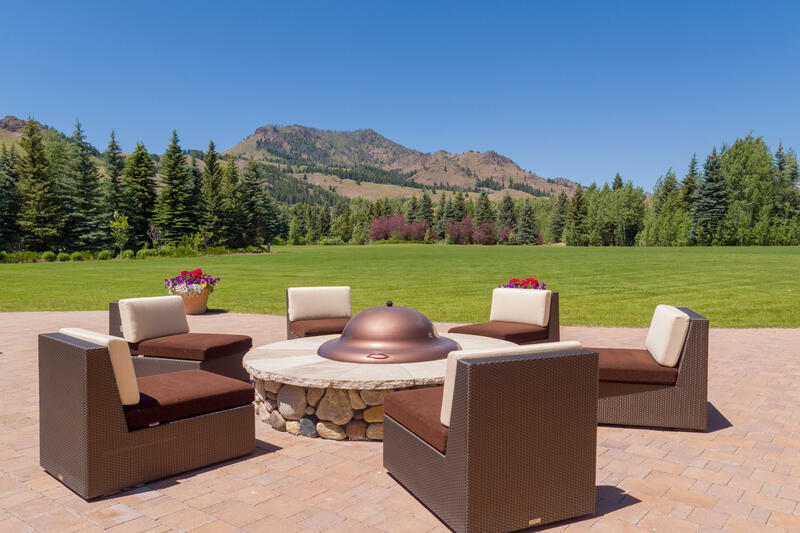 This is a spectacular enclave for al fresco entertaining and taking in views of the Boulder Mountains and Griffin Butte. 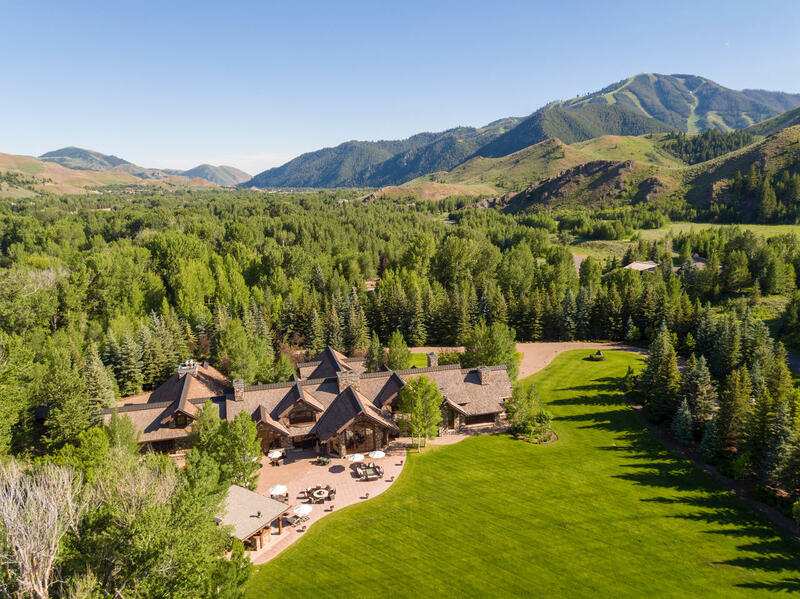 Altogether, the property includes 1.5 acres of paved patio and pathways for easy enjoyment, and it is gated and fully fenced for privacy and security. 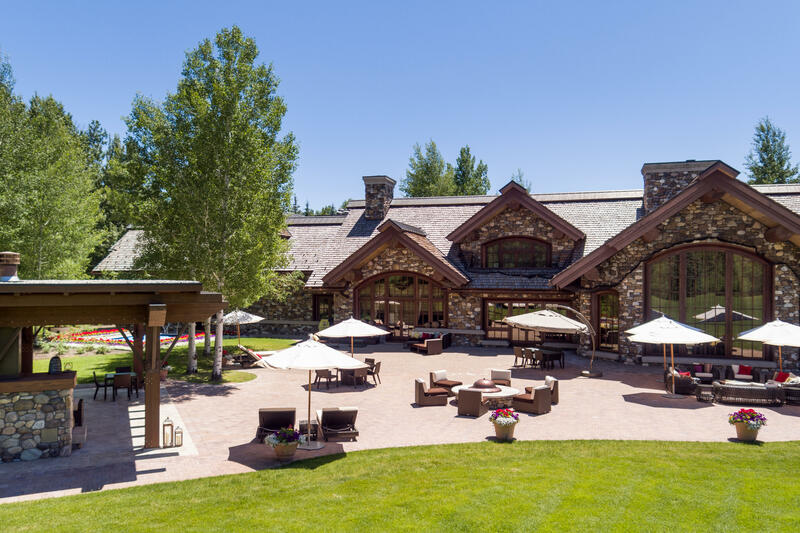 Of course, a residence of this pedigree is built from the inside out with state-of-the-art systems to ensure generations of robust, trouble-free living. 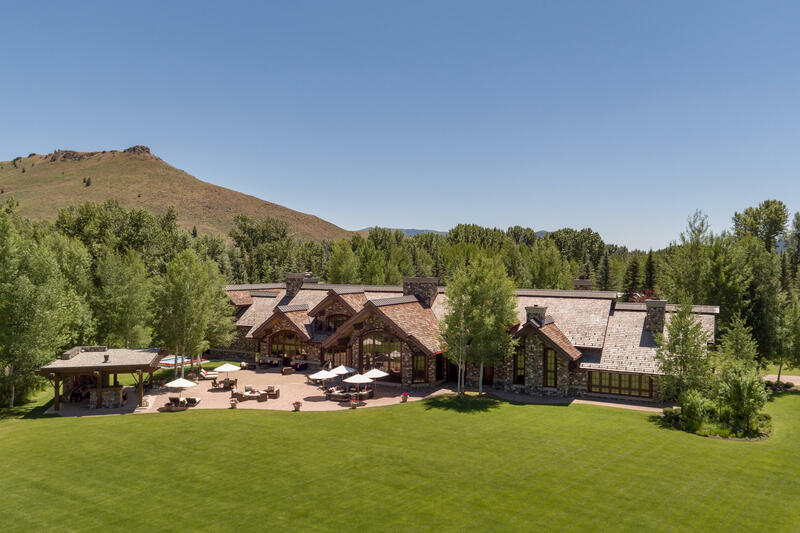 Originally designed by noted lodge specialist, James Ruscitto of Ruscitto, Latham, Blanton Architectura, the house was painstakingly constructed by Intermountain Construction using a steel structure with curtain wall framing and logs that came from Ruscitto's own mill. 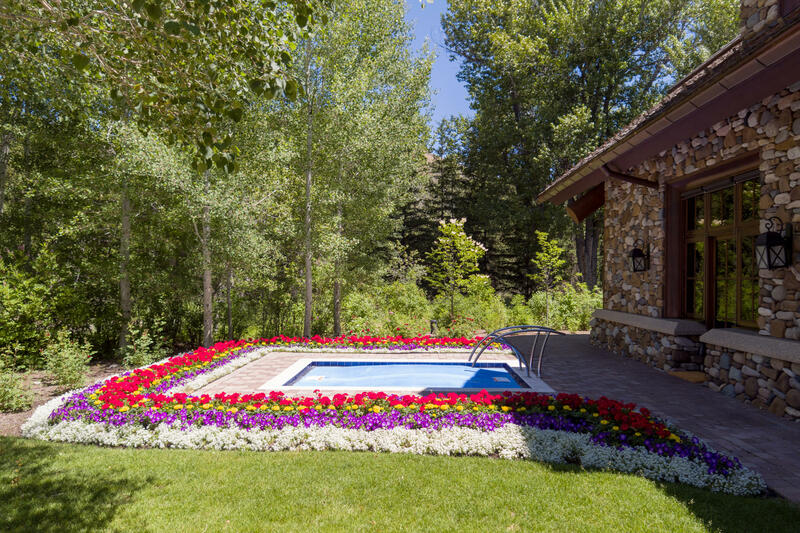 It includes a pumping system to mitigate flood risk, and high-efficiency hydronic heat. 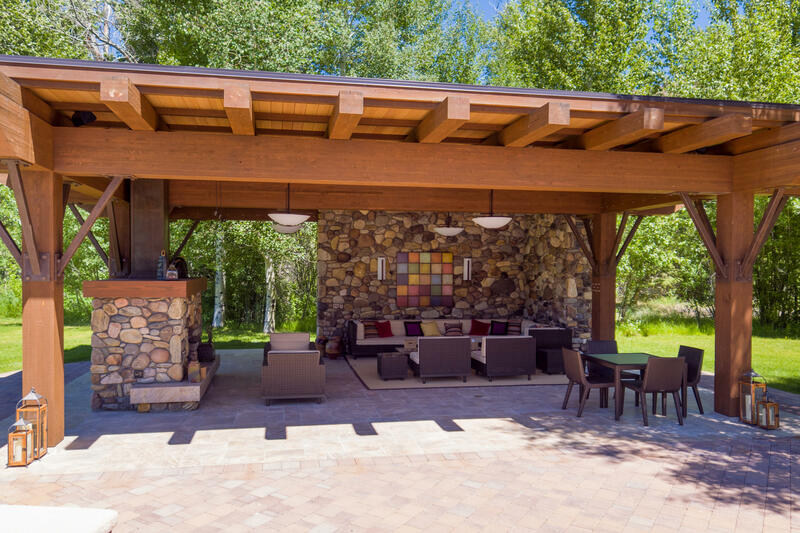 All tiled floors are radiantly heated, and the front entry paths and driveway are warmed by a snow-melt system for easy and safe passage. 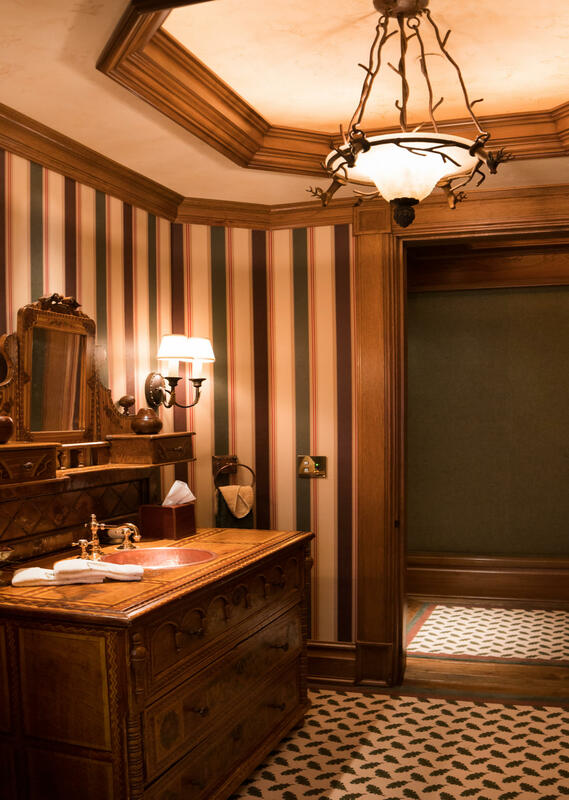 Finally, a comfortably appointed residence for the household manager includes a butler's pantry, laundry and bed and bath suite. 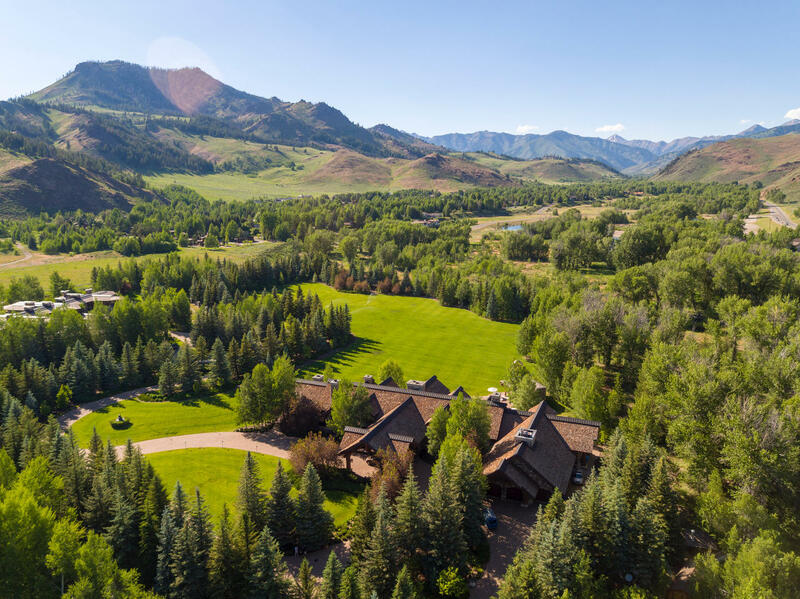 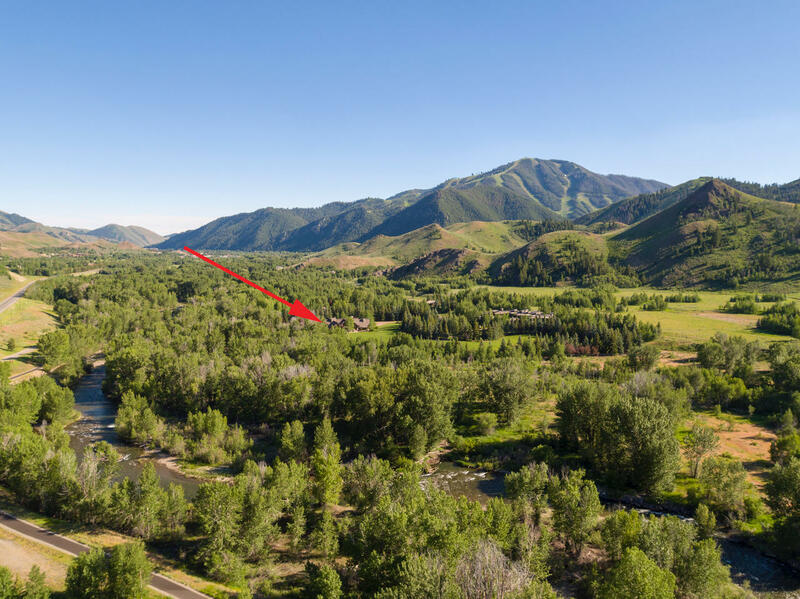 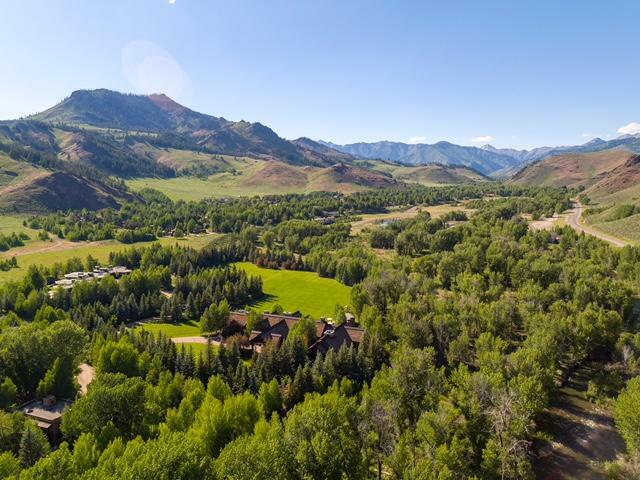 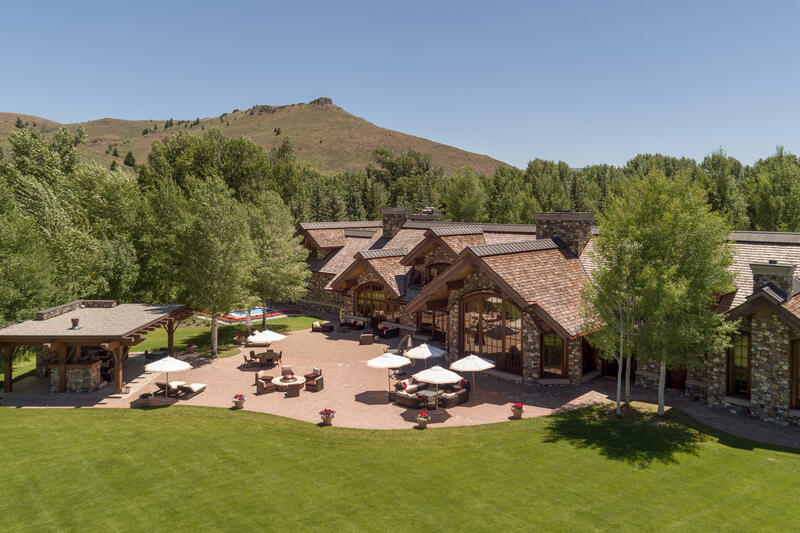 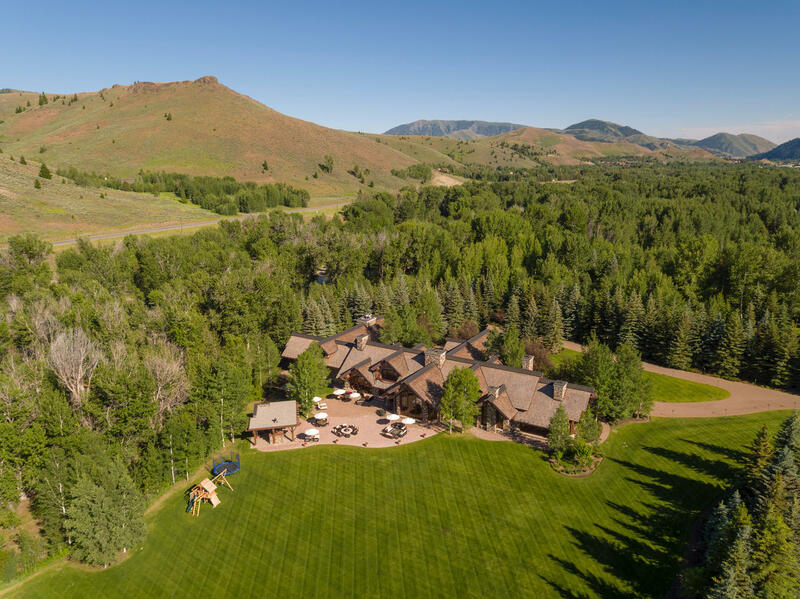 This is as fine a mountain retreat as has ever been conceived, and it is one of the crown jewels of Sun Valley's exceptional landscape of country estates. 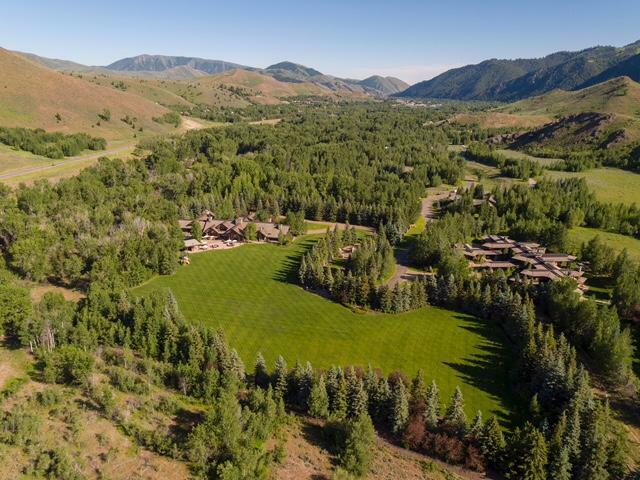 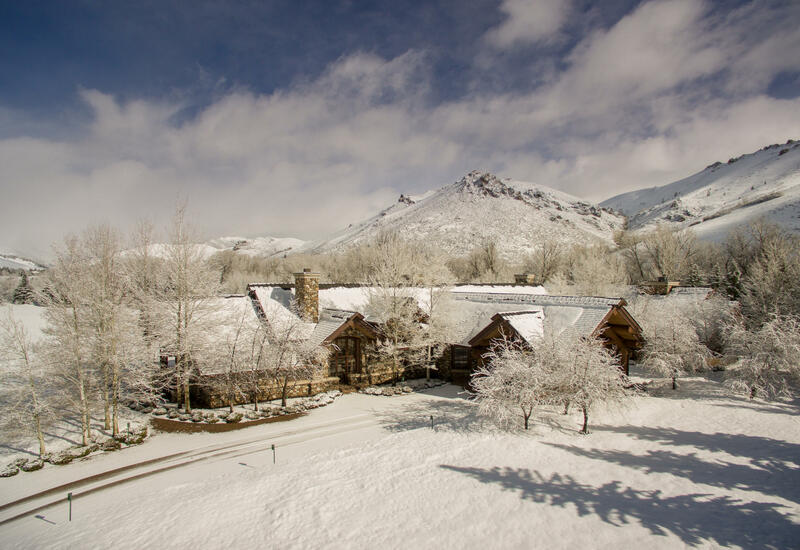 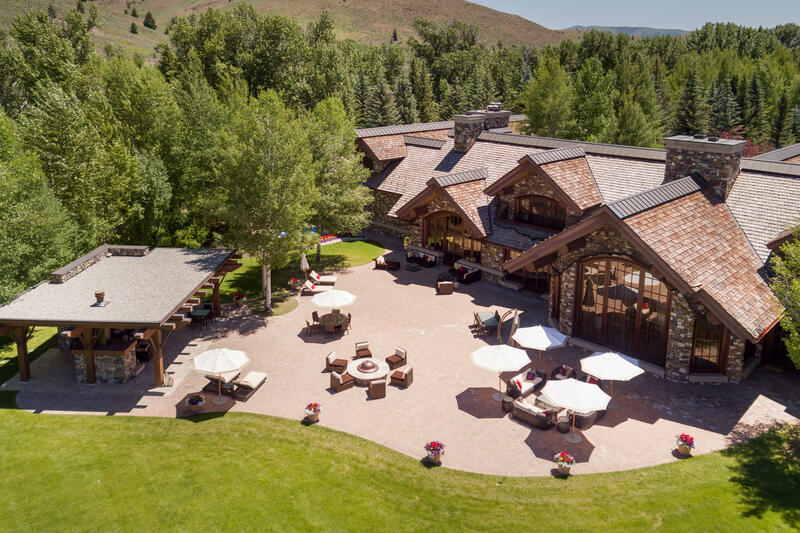 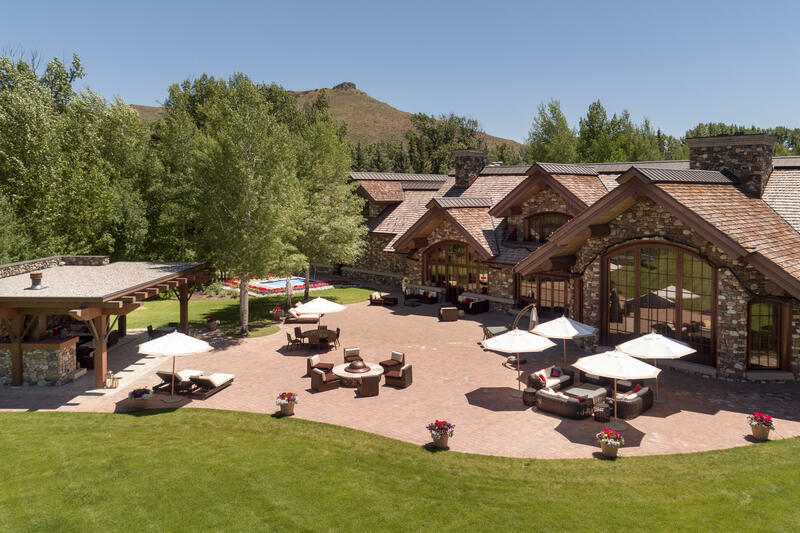 With twelve acres of exquisite mature landscaping, unparalleled outdoor spaces for entertaining and relaxation and a residence that is without equal in craftsmanship and timeless design, it is the pinnacle of Western country living in one of the country's most cosmopolitan, yet down to earth ski resorts. 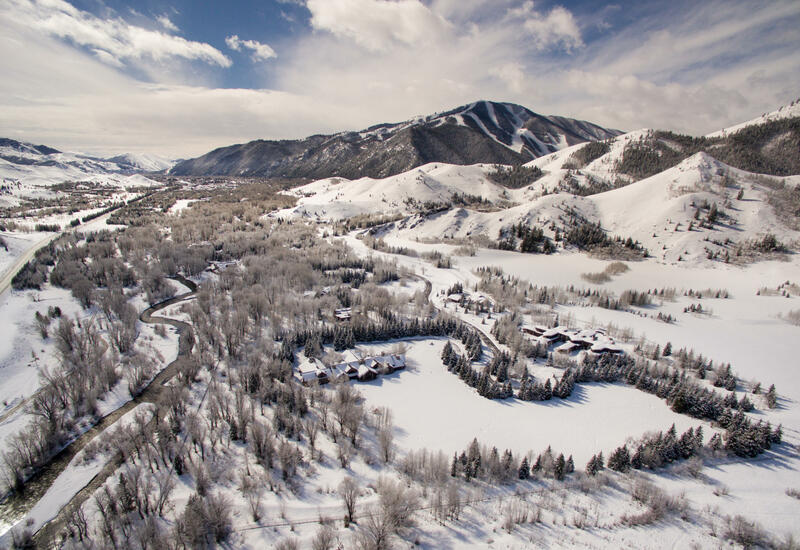 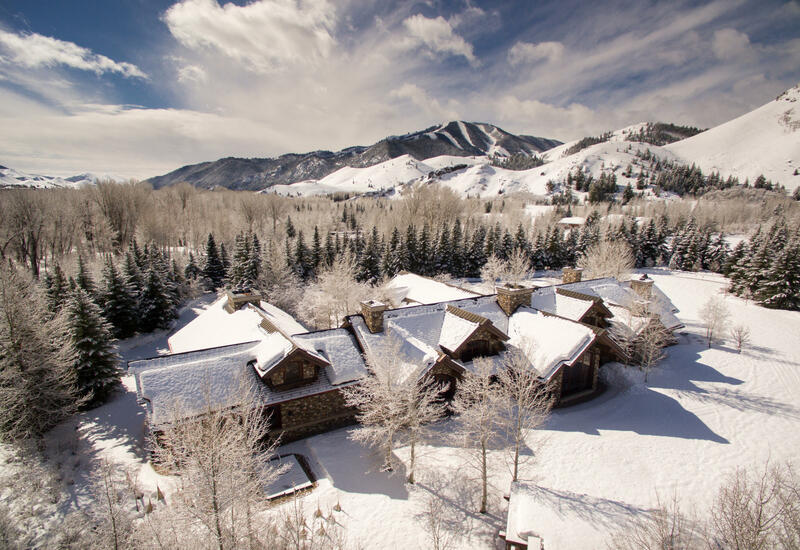 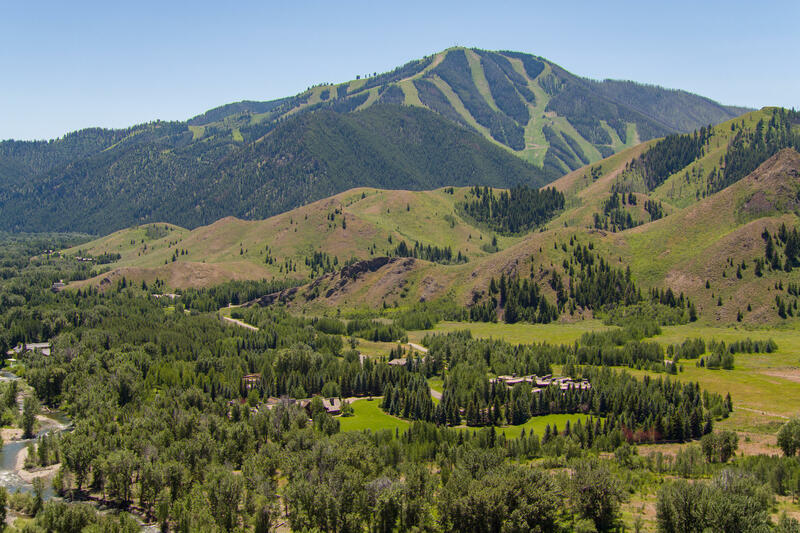 Sun Valley's year-round cultural and recreational amenities make this an ideal retreat or full-time residence for the discerning nature lover.